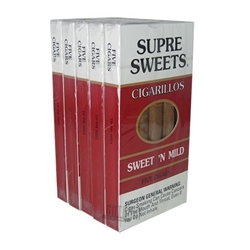 Loved by cigar connoisseurs everywhere, Supre Sweets Sweet N Mild Cigarillos are machine-made with a rich combination of Dominican tobaccos inside an Indonesian wrapper. After every draw, Sweet N Mild’s give the smoker a well-balanced blend of strength and texture, a smooth mild aftertaste with a touch of sweetness, topped off with a refreshing aroma. A sophisticated cigar that’s very affordable, a perfect complement to a post-dinner cocktail. Try them out here at Smokers Discounts!